We are long time fans of Blossuming Lotus in Newtown and happy to find their Dixon House food court stall is same same but different. The wonderful bainmarie-of-love is is similar but there is much extra cooked-to-order goodness. And lordy, these folks can cook. We first started touring the menu out of curiosity - eg how they the heck do they make a papaya salad without fish sauce? Answer: awesomely. The flavours are lighter and it may take a moment of adjustment before the cartoon lightbulb appears above your head. The flavours are clean and gentle, allowing the ingredients to poke through, we can actually taste the vegetables, it's hasn't been gurney-ed with salt and sugar. We are carnivorous folks but will often choose vegan Thai over it's butch, meaty uncle, especially over the recent hottest-on-record summer of 2016/17. On a super hot day a light vegan Thai salad or stir fry is wonderfully kind to our innards and energy levels, not to mention waistlines. Last time we visited southern Thailand we stumbled across a bunch of local Thai vego joints but never got around to trying them. We won't make that mistake when we are back there this coming May. 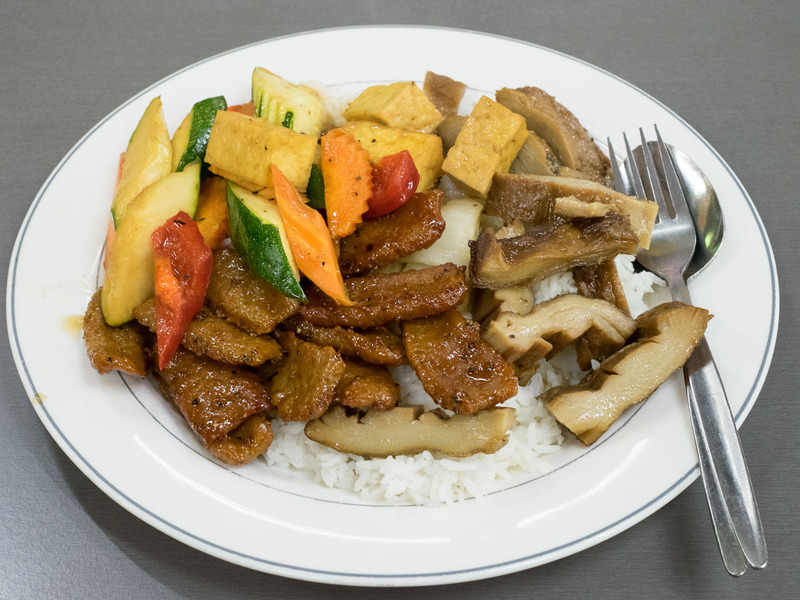 Two dishes on rice for nine bucks - the bainmarie-of-love oozes point'n'chew specialness. Here we go for some chili basil veg'n'tofu, strips of mock duck (plain on it's own but delicious when sauced up right, we seriously love us some tvp) and some fried tofu which is bacon-esque in it's crunchy oily naughtiness. Two dishes on rice for nine bucks - chili basil tempeh and mushroom, plus chili basil eggplant. It may be ugly but jeepers peepers it's good. The heat and spice level is super low giving room on the taste buds for the ingredients stand up and sing for themselves. We love the nutty oomf of the tempeh and it's cooked just right (tempeh can be cooked just wrong, like when we cook it), and the eggplant tastes nice and eggplanty-y. This place is a real celebration of the vegetable. We dig. Pad see eew $9.9. Stir fried flat noodles. It's plain at first bite, not a lot of chili and spice, but it's oh so perfectly cooked with the required smoky wok flavours, along with gentle veggie and tofu. Pass the Kool Aid. Duck salad $9.90. A surprise killer dish - the veggie duck is fried and crisp making a lovely counter to the fresh salad. Highly recommended if you're up for a light, lo cal lunch. Chinese broccoli with soy pork $9.9. Like the duck salad, the crisp fried veggie pork belly is a perfect buddy to fresh Chinese greens. This is perfect summer food: light, mostly very healthy and easy on the system. The spicy fried rice - $9 was the only dish to disappoint. It cried out for some kind of faux fish sauce or perhaps lime to give it a lift and cut the sweetness. 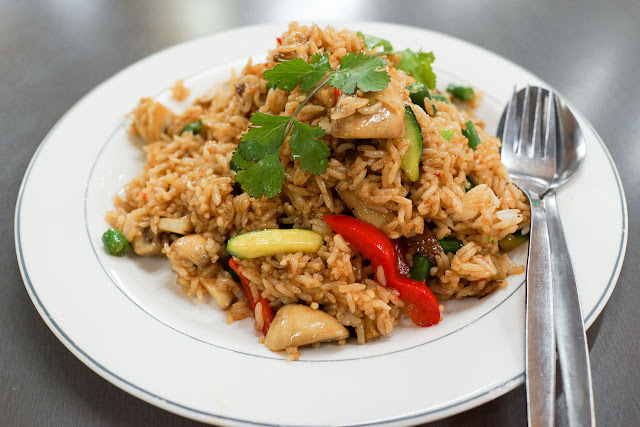 It was ok but nowhere near the fried rice greatness we reckon the chef is capable of. 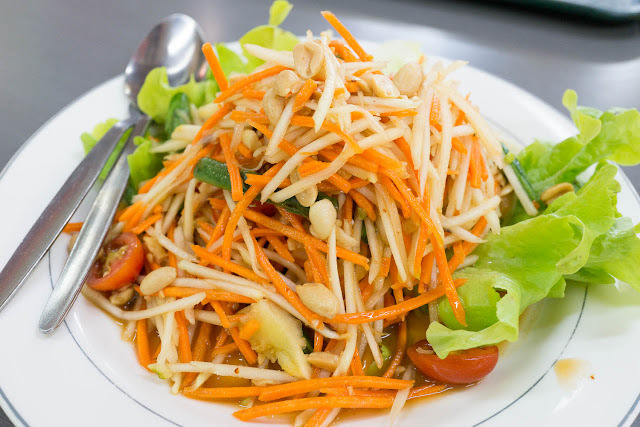 Papaya salad - $9.90. Another great light summer lunch, easy on the spice but oh so fresh. Suki - $9.80. 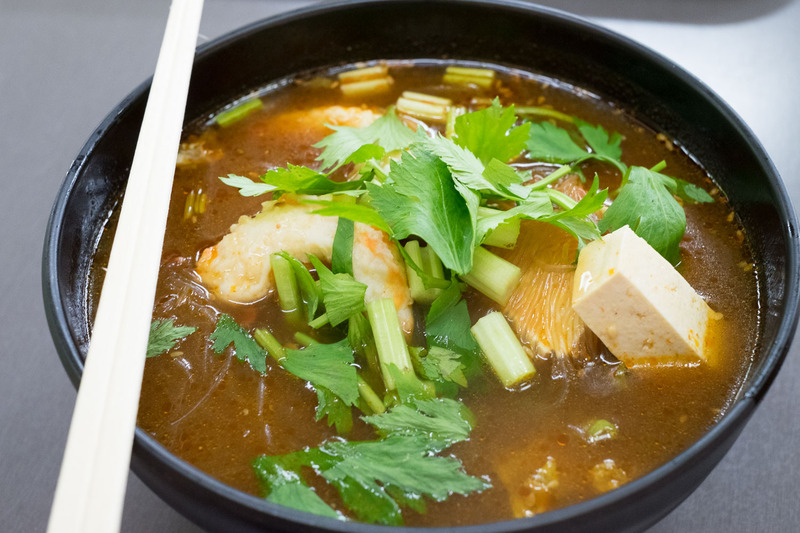 A soup with a fairly spicy tamarind broth, glass noodles, firm tofu,cabbage, carrot and coriander. We love the mock prawns on top, complete with mock orange bits, taste of seafood extender. Thumbs up. 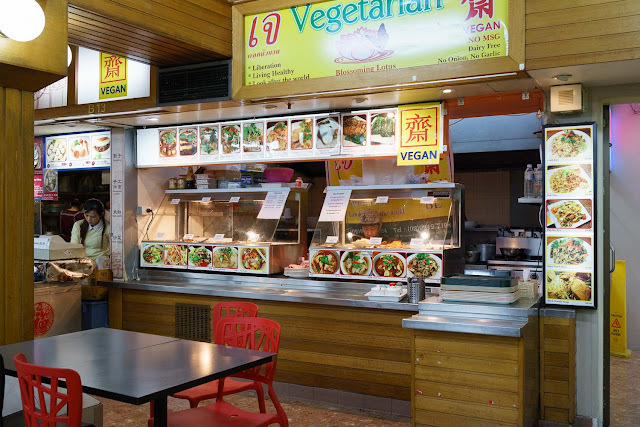 Blossoming Lotus is in the most glorious Dixon House Food Court, cnr Little Hay and Dixon Street, Chinatown. Looking forward to eating with you in Thailand.